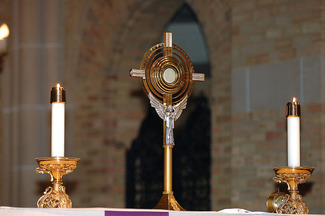 There will be Eucharistic Adoration on Wednesdays from 9:00 am to 7:00 pm in the Holy Family Chapel during Lent. There must be someone present with the Lord at all times so we ask that at least 2 people commit to being there for each time slot. Please sign-up below if you are able to commit to a time. We have divided the time into one hour sections, but you are welcome to sign-up for mulitple times. All are welcome to attend Adoration, the sign-up is just so we know someone will be there. There will also be our usual Eucharistic Adoration on the first Friday of the month on April 5th. Will I have access to a restroom? The Parish Office is open until 4:00 pm and you are able to access the restroom there. After the Office closes, there is not a restroom available. What do I do during Adoration? Spend time gazing upon the Lord! Of course that's not always as easy as it sounds. Some people like to sit in silence and just be in the Lord's presence, but some people feel like they should be doing something. So what can you do in Adoration? Prayer in it's many forms is a great way to spend your time in Adoration. You can pray for healing or tell God what you're thankful for. You can read the Bible or spend time in Ignatian meditation. You can write in your prayer journal or read a book about a saint and ask for their intercession. You can pray the Rosary. You can even listen to praise and worship music on your headphones (try Audrey Assad or Matt Maher). What if I can't stay for the full hour? Even five minutes in Adoration is time well spent. If you can't commit to a full hour, just come to Adoration when you are able without signing up. We do the sign-up to assure that someone is always "keeping watch" with the Lord, but Adoration is not limited to the people who have signed up.